Two families who went to the mortuary of the Benin Central Hospital on Friday to pick the bodies of their relatives received the shock of their lives as the corpses could not be found. 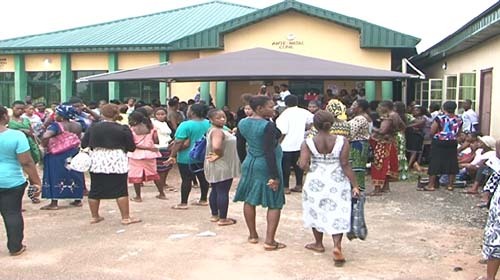 The situation resulted in a commotion at the Edo State-owned hospital as the aggrieved family members threatened to shut down the hospital before the arrival of policemen, who brought situation under control. The two alleged missing corpses on Friday were those of Abifade Idemudia and Lawrence Agbonlahor. A son of the late Abifade Idemudia, Michael, said he last saw the body of his 54-year-old father three days after the body was deposited on November 21, adding that members of the family were in shock over the missing corpse. He said, “We brought the corpse to this hospital on the 18th of November, 2015. We came to check on the 21st November when they called me to come and pick his clothes. Mr Friday Agbonlahor, who is a brother of the other missing corpse, Lawrence Agbonlahor, said he last saw the body of his late brother only three days before (Tuesday) and that he could not explain the circumstance surrounding the disappearance of the body at a time he was to be buried. He said: “I came to see the body twice in about three weeks to ensure that they take care of it. However, when we arrived today to pick the body, it was nowhere to be found. “This morning (Friday), somebody came to tell us that there was a problem in the mortuary because of missing corpses. I never envisaged this. No member of the management of the hospital could be reached as they were all said to be in an emergency meeting over the development. Calls made to the Chief Medical Director of the hospital, Dr Omorodion Uwadiae, were also unsuccessful. Some other families who had deposited corpses at the hospital’s morgue were later seen taking the bodies of their departed ones out of the hospital.